We were lucky! I think we caught the most beautiful day in February for our trip to Portland Island. The island is part of the Gulf Islands National Park Reserve and is easily reached by a passenger ferry departing from Canoe Cove. Of course you can also use your own boat or kayak over to the island as well. We had a fabulous ferry ride with Brian from Eco Cruising. He is a great story teller and so knowledgable about marine life. 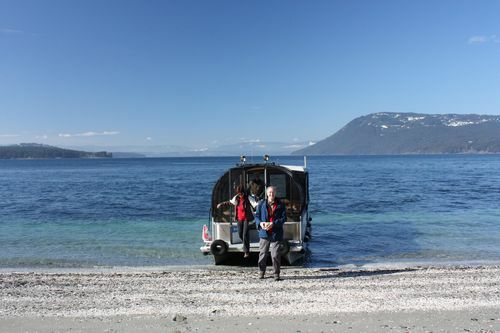 He offers Eco Cruises, operates a little water taxi to Piers Island, Sidney Spit, and Butchart Gardens from Brentwood Bay, and is also available for private charters. It was a sunny day with some wind expected for the afternoon. After a pleasant 25 minute ride over to the island we landed on Shell Beach. The island was once the site of a First Nations village and the shell midden beaches ringing the island are quite spectacular. Those middens were build up through thousands of years and are many metres in length, depth. The moment you steep off the ferry you can feel the sacredness and peacefulness of the land. Such a different energy, away from the hassle of cities, traffic, and all those people with their endless tasks. We all got really quiet and relaxed and our plan of surrounding the whole island had to be cut short in the end to get back in time for the ferry pick up. We had a lovely picnic on a beach just past Princess Cove, sitting in the warm winter sun. We saw racoons in the very North of the Island, which apparently spend their winters on Salt Spring Island. Lots of wind, waves, and wild energy there. A fairy landscape in the south west with lichen, moss, and the first little wild flowers popping up and the gorgeous white mitten in the South. Lots of hiking to explore. Bring your tent and stay for a night or two or just take a day trip with your kids to Portland Island. Or if you'd like it all organized talk to Marion from Trek and Treats. She offers everything from 2 to 7 days of hiking, from Sidney to Sooke.